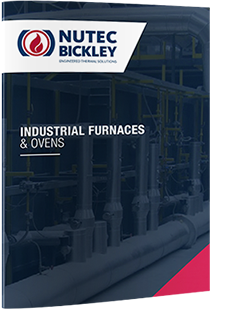 Flexible designs in one unit to comply with Temperature uniformity surveys (TUS) from 200 F to 2400 F.
Nutec Bickley provides Heavy Duty Box Ovens line in custom designs for the following process applications up to 1200°F. Aging of aluminum parts, Tempering of steel parts, Stress relieving of steel parts, Curing, Drying and Preheating. Gas fired, indirect gas fired and electric heating systems are available. Controlled cooling of forgings and castings, Air quench chambers and Blast cool chambers after heat treating. Controlled Air handling system with air inlets and outlets in order match desired cooling profiles during transformation. Option of using auxiliary on/off heating systems to control cooling rate depending of process requirements. Insulation system designed according to inside temperature and cooling requirements. Customized air blast cooling chambers for air quenching and for safe parts handling after heat treatment. Preheat tools for hot assembly, dies of presses in the forging plants, Preheat the load before heating for forging or heat treating, Aluminum sows, tee´s, ingot preheating before melting, Steels mold preheating for hot coating and Steel mold preheating for aluminum foundries. Use of external energy source using hot gases from existing forge or aluminum melting furnaces. Increasing of the energy usage from Forge Furnaces either to pre-heat load, or molds.